The Crystal City facility, located next to a town of the same name, was originally a Farm Security Administration migratory labor camp for 2,000 people. When it was converted to an internment camp, Crystal City was expanded to house 3,500 people, and a fence and guard towers were added (Figure 17.3). Internee facilities included apartments with shared bathrooms, three-room cottages, and one-room shelters, all within a 290-acre area (Walls 1987; Figure 17.4). Figure 17.3. Crystal City Internment Camp. Figure 17.4. Housing at Crystal City. Although the internment camp was originally intended only for persons of Japanese ancestry and nationality, 35 German aliens and their families were the first to arrive, in December 1942. The German imprisonment (and that of one Italian family) at Crystal City was to be temporary while other facilities were being prepared for them. These first internees helped in the construction at the Crystal City camp. The first Japanese U.S. resident aliens arrived at Crystal City in March 1943. Rather than relocate the Germans the camp was divided into separate sections for each ethnic group. Figure 17.7. 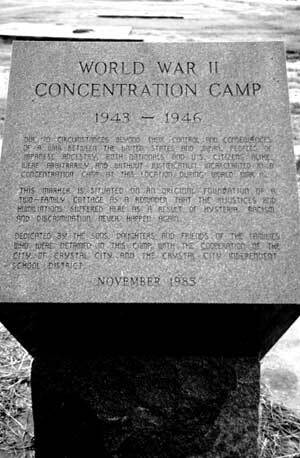 Monument at the site of the Crystal City Internment Camp. The peak population of the Crystal City camp was around 4,000, of whom two-thirds were of Japanese ancestry. About 600 of these were from Hawaii and 660 from Peru. Because of the unwilling presence of the Japanese Peruvians, the camp was not closed until late 1947. The Peruvian government did not want the Japanese Peruvians returned, most did not want to go to Japan, and the U.S. government who brought the Japanese Peruvians to the U.S. claimed they were illegal immigrants who could not be released. Eventually the Japanese Peruvians left for jobs at Seabrook Farms in New Jersey, as many Japanese Americans had done previously. Today the town of Crystal City has grown around the internment camp site, which is now owned by the school district. A local landmark present during the internment still stands, though it has been moved from the town park to the town hall (Figures 17.5 and 17.6). This statue of the cartoon character Popeye was erected in 1932 as a symbol of the self-proclaimed "Spinach Capital of the World." At the internment camp site there are three schools, athletic fields, a small airport, city social services buildings, and a recently built low-income housing project on the site. A monument commemorating the internment, a large engraved granite block (Figures 17.7 and 17.8), is located on a former cottage foundation. There are five other cottage foundations in the immediate area (Figure 17.9). Other possible camp remains at the site include a few scattered foundations (Figure 17.10), a well (Figure 17.11), and some road alignments. An elementary school building is in the same location and in the same configuration as the former German internee elementary school (Figure 17.12). One of the more interesting features remaining is that of the camp's large concrete swimming pool, now filled in with dirt and overgrown with vegetation (Figures 17.13 and 17.14). Access to the eastern portion (rear) of the camp site is restricted by the airport and private land. This area would have likely had the hog farm, landfill, and sewage disposal facilities, as well as a picnic area known to be on the nearby Nueces River.